Des Moines Register Tues., Oct. 26, 1965 Page 5 of Trial Funds ard J. Constantineau Wife Was Worried ecords at the gun shop nted out some increases sales that had taken shortly after Constanti ned the Klan. rst Constantineau said it hop gers velers venth St. e Lowest ces on amond dal ts ndard ke tches Irving " was possible" that his joining of the Klan had helped his gun business, but then after reflecting on the details he said that some of the increases that Weitner made reference to were probably "seasonal" Arthur C. Leonard, 61, identified as a Klan member from Spencer, N.C., took the Fifth Amendment. Leonard was identified as a Klansman since 1953. 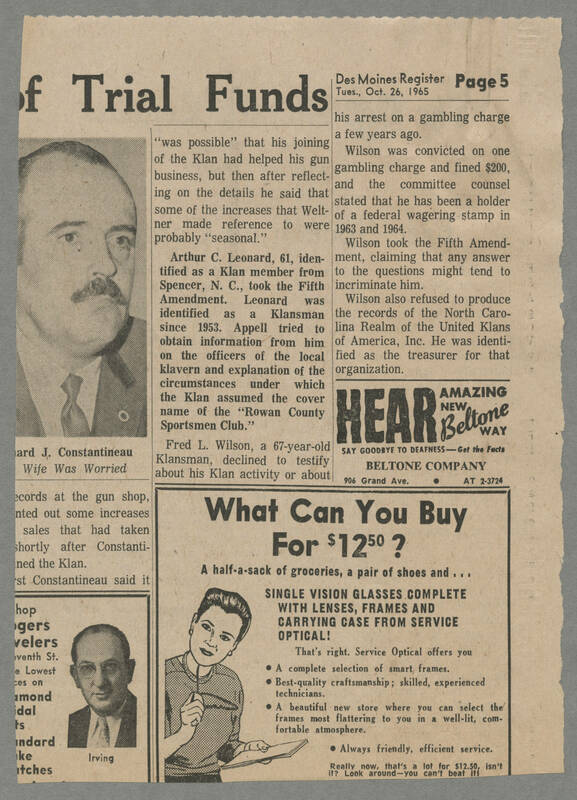 Appell tried to obtain information from him on the officers of the local klavern and explanation of the circumstances under which the Klan assumed the cover of the "Rowan County Sportsmen Club." Fred L. Wilson, a 67-year-old Klansman, declined to testify about his Klan activity or about his arrest on a gambling charge a few years ago. Wilson was convicted on one gambling charge and fined $200, and the committee counsel stated that he had been a holder of a federal wagering stamp in 1963 and 1964. Wilson took the Fifth Amendment, claiming that any answer to the questions might tend to incriminate him. Wilson also refused to produce the records of the North Carolina Realm of the United Klans of America, Inc. He was identified as the treasurer for that organization. HEAR AMAZING NEW Beltone WAY SAY GOODBYE TO DEAFNESS- Get the Facts BELTONE COMPANY 906 Grand Ave. AT 2-3724 What Can You BUy For $12.50 A half a sack of groceries, a pair of shoes and .... SINGLE VISION GLASSES COMPLETE WITH LENSES,FRAMES AND CARRYING CASE FROM SERVICE OPTICAL ! That's right Service Optical offers you A complete selection of smart frames Best quality craftmanship; skilled, experienced technicians. A beautiful new store where you can select the frames most flattering to you in a well-fit, comfortable atmosphere. Always friendly efficient service. Really now, that's a lot for $12.50 isn't it ? Look around- you can't beat it !